The system offers a storage backend for relational data (SQL or NO-SQL Database) and a way to store mass data (files, attachents, photos,….). 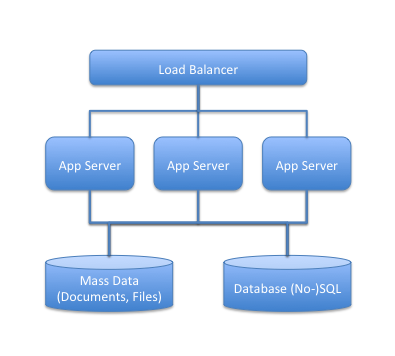 On top of the storage backend the web worker is responsible for processing all user request in the system (complex applications have also background worker, of course). The load-balancer in front of the system delegates requests to the next free worker server. Today, Amazon AWS is not the exclusive IaaS provider but is one with a sophisticated infrastructure. I’m using Amazon AWS in these articles because you have the option to try it out for free, right now. Amazon offers a Free-Tier-Program for all new customers without any fee. Amazon S3 – A highly scalable and distributed storage system for mass data, which allows storing nearly everything behind a unique key. Every element is accessible through a RESTful web service. Amazon RDS – To make it simple, it’s MySQL for the Cloud. Amazon offers a multi site, sharded database system, which allows to create as many databases as you need. 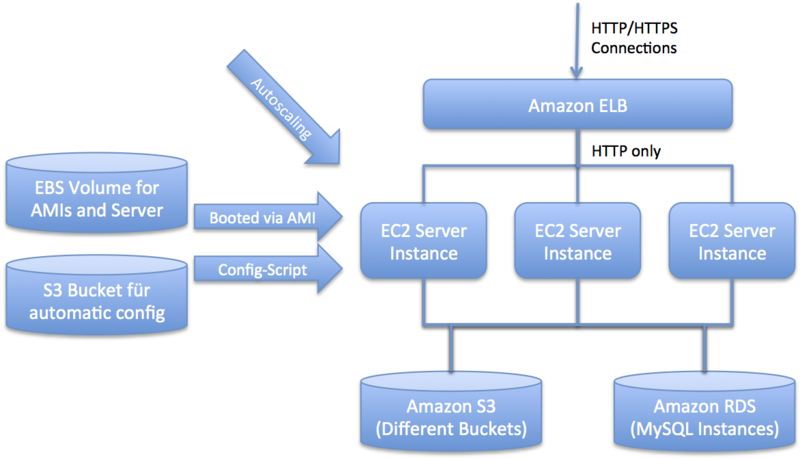 Amazon EC2 – The elastic cloud (EC2) allows to get virtual machines on demand as needed. This machines are provisioned based on an existing AMI (Amazone Machine Image) and will be provided immediately. Amazon ELB – The Elastic Load Balancer is responsible for receiving all HTTP(S) request and redirects the request to a free node in the cluster. The ELB is also highly integrated in the AutoScaling service so if needed the cluster behind the ELB can be expanded automatically. In the next parts of this series I would like to cover some more detailed topics, e.g. During the last 7 years I used GeeksWithBlog as my private blogging platform. In this time the platform became a little historic and the operators did not add some standard features I miss. Because of that I decided to migrate from GeeksWithBlog to WordPress. The old blog will stay online as long as the team operates their service. You can find my older posts here.